December 13, 2016 - Taipei Taiwan - GlacialTech, was established in 2001 with a background in thermal products. In 2005, it expanded into Switch Mode Power Supplies (SMPS) and LED lighting products. Heat dissipation is not the only consideration for superior thermal design – lighter weight, smaller size, and lower costs are also key. Heavy and large thermal solutions increases the cost of mechanisms and accessories. Of course, packing and transportation costs also increase. Heavy weight lighting fixtures are not good for ceiling installation either, as they might affect the structural integrity. If each bay light fixture weighs more than 2 kg, then 500 fixtures installed on the ceiling would bring one extra ton of weight. 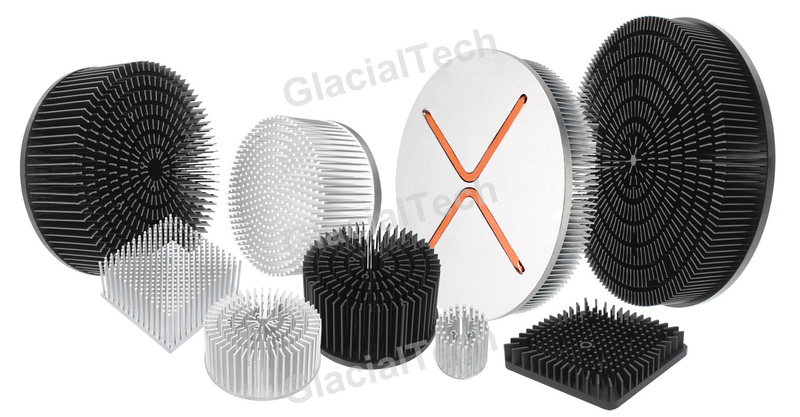 Therefore, GlacialTech’s thermal design philosophies are cost performance, weight performance, and volume performance. Most thermal solutions are designed using aluminum and copper materials. The manufacturing process of aluminum extrusion, cold forging, and die casting are all based on aluminum, but thermal conductivity is variable. Using AL1070 aluminum, the thermal conductivity of cold forging is 227 W/mK and 2.36 times more conductive than die casting at 96.2 W/mK. Most thermal solutions in LED lighting fixtures is based on passive design, using no cooling fan. Based on the thermal conduction point, and under the same power consumption, die cast designs need at least double or even triple the size and weight – much bigger and heavier than cold forge designs. This is the main reason cold forged heat sinks are more popular in LED lighting fixtures. The Cold forge process is a very good solution, especially in low-power applications eg. below 100W. When power demand goes up to 200W, 300W, or even 400W, cold forge solutions begin to become challenging to manufacture compared to other processes, especially given weight considerations. If we want to produce very large cold forged heat sinks, we might combine the process with other manufacturing technology, for example Friction Stir Welding (FSW). Stamping is the standard process for creating sheet metal parts and GlacialTech applies it to make stake fins and insert fins for its thermal modules. The advantages are lighter weights and improved scalability, especially designed for high power solution. Stamping can expand the scalability of thermal solutions from tens watts easily up to several hundred watts. Aluminum die casting is very popular for a wide range of applications and is not limited to thermal designs. In the lighting industry, it is easy to find die casting designs in bay lights, explosion-proof lights, flood lights, spot lights, street lights, and even general lighting accessories. The size can vary from small to large with a variety of shapes. In general, the disadvantage of this process is thermal conductivity if designed for thermal solutions, but there are myriad possible design styles. Aluminum and copper are popular materials in manufacturing skived heat sink fins, the advantage is higher density especially suitable for active cooling design heat sinks. The disadvantage is unique fin direction. These styles are usually designed for servers and IGBT applications. Friction Stir Welding (FSW) is the manufacturing process by which two separate metal pieces are melded into a solid single piece. This process removes the necessity of large molds in creating cold forged and aluminum extrusions. There are several important parameters in the melting process: tool design, rotation, traverse speeds, tilt, and plunge depth. Inexpensive lighting products seldom use the FSW manufacturing process. 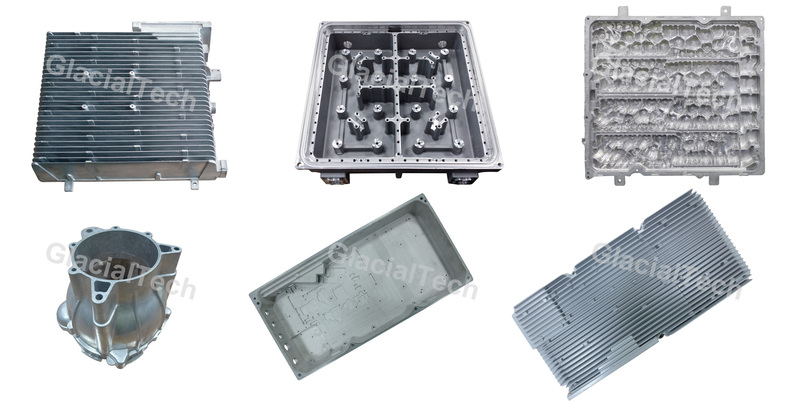 GlacialTech Inc., was established in 2001 by a team with many years of experience in thermal module design and manufacturing for internationally renowned brands including Apple, Canon, Dell, Foxconn, HP, Intel and SONY. Since being established, GlacialTech has designed thermal modules for Acer, AdvanTech, Fujitsu Siemens Computers GmbH, Panasonic and Siemens AG. GlacialTech's thermal solutions are designed with a focus on cost-effective performance, as well as weight, noise and volume reduction. Applications include commercial and industrial computers, telecommunication products and LED lighting solutions. Please visit the company homepage at www.GlacialTech.com or visit us on Facebook at www.facebook.com/GlacialTech/.